XL+ Probe - KNS Canada Inc.
Today, the global epidemic of overweight and obesity – “globesity1” – is becoming a major public health problem in many parts of the world. More than 1.1 billion people are estimated to be overweight worldwide. Around 320 millions of them are now considered as obese. Until now, as reported in several studies, the performance of FibroScan® 502 was limited in overweight people (from and above 25-28kg/m²)2 resulting in a difficult even impossible examination of these patients. 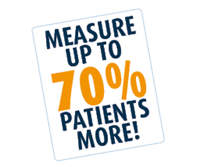 Indeed, measurements with FibroScan® may fail on obese patients for several reasons. 2.Foucher, J., L. Castera, et al. (2006). Prevalence and factors associated with failure of liver stiffness measurement using FibroScan® in a prospective study of 2114 examinations. European Journal of Gastroenterology & Hepatology 18(4): 411-2. Expand your diagnosis with our new specific product for a better clinical assessment. 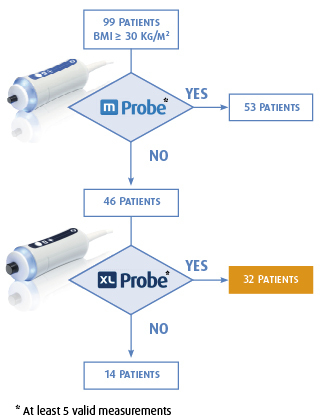 Before each liver stiffness examination, for optimal performances of the XL Probe, Echosens recommends performing a localization of the liver and assessing the Skin Capsula Distance (SCD). The SCD is the key parameter because liver stiffness measurements start at a fixed depth depending on the probe type chosen. SCD represents the distance between the point of application on the skin of the transducer and the hepatic capsula. This parameter is not readily available from patients, so Echosens provides an ultrasound scanner. The TP is generally correlates to thoracic subcutaneous thickness. It can therefore be used as a substitute criterion if Skin Capsula Distance is not available and if the thoracic perimeter exceeds 110 cm. Even though BMI indicates if someone is obese, it is not a reliable criterion for the use of the XL probe because it is not indicative of the fat localization. For example, the XL probe makes possible measuring patients with a BMI of 60 if the SCD is less than 35mm. Technical leaflet: Download the features of probes.